When everyone is happy with dinner, it helps to make it a lovely family time and burgers are one of those meals. 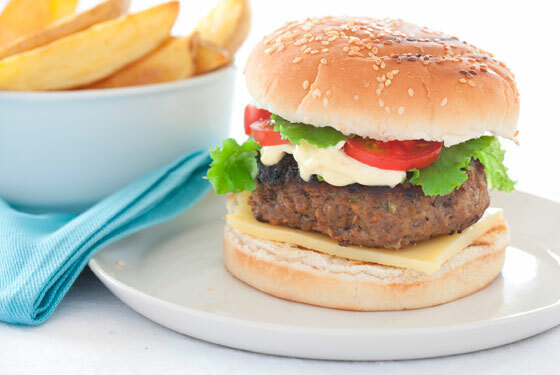 a classic hamburger uses beef mince and there is no point paying extra for lean meat. Lean mince will cause patties to crumble, the meat needs some fat to help hold the mince together. While some recipes call for patties that are essentially all meat, this gives a dense and sometimes dry patty. Without overloading the patty with extras there are a few key ingredients that will enhance the flavour and texture. The addition of gently sautéed onion will give a little sweetness, 1 egg per 500g of mince will help to bind the mince and 1/2 cup of fresh breadcrumbs or chopped rolled oats (food processor) to the same quantity, will also help to bind the mixture and also retain moisture. Aside from salt and pepper, herbs and spices are optional and a personal choice. Meat patty mixture should be lightly mixed and not pummeled into shape, the more you mix the tougher it can become and the same goes for “slapping” it onto the grill. Some swear by a drizzle of beer or cream in their patties but I have never tried either, have you? Patties need to be cooked in a frying pan over a medium heat until browned on both sides and thoroughly cooked through. I usually have the oven on and transfer patties that are cooked on the outside to the oven to continue cooking through. Cheese can be placed on one side of the patty once it has been turned, this will melt while the bottom half cooks. If you have freshly minced your own meat then it is OK to eat it pink in the middle but bought mince should always be cooked through (as should meatloaf and sausages). In most situations I would pick homemade or artisan bread over commercial, burgers are the exception. With a robust patty and other filling, the bread should be enough to support the burger but not a meal in itself. Fluffy white burger buns such as Tip Top bakery make are perfectly acceptable with the option being sesame seeds or not. Slice and butter if you like (or not) and toast until lightly golden. 1. Mix all ingredients together in bowl until just combined. 2. Shape into 6 patties and then place on a tray lined with baking paper. Refrigerate for 1 hour (if you can). 4. Heat a film of oil in a large frying pan over a medium heat and cook patties in batches until brown on both sides and completely cooked through (Alternatively you can brown patties in the pan and then finish off cooking in the oven). Serve on buns with your favourite toppings. Some popular toppings include; cheddar cheese, fried onion, mushrooms, blue cheese, bacon, lettuce, rocket, tomato, cucumber, avocado, brie. And if you are not a carnivore and want something delicious for you while the family enjoy their burgers. What are your favourite burger toppings and do you always use beef mince? Do we still put beetroot in burgers or was that just take away shops in the 70s and 80s? Also – a pineapple ring. Beetroot’s acceptable any time. No egg (only if it was a breakfast burger, which I’ve never had).